Drawing animals from life is a challenge for me. If you've ever tried to draw your pet, you'll know that even a sleeping animal will move. Then move again, and again....and.... again. Field sketching's like that, but even more frustrating, especially when you're trying to look through binoculars at the same time and trying desperately not to fall over! Visiting a zoo, wildife park or city farm is a great way to get close to animals without falling down. They still move of course, but you do have a better chance to observe them at close quarters; hopefully without ending up sitting on your bottom! Now, in my perfect world, we'd have no zoos. Sadly we're a long way off that, but many, like Bristol Zoological Gardens do valuable conservation work and try to educate the public about the need to protect our wildife and environment. So a few weeks ago I went sketching at Bristol zoo with an artist friend and fellow nature lover. 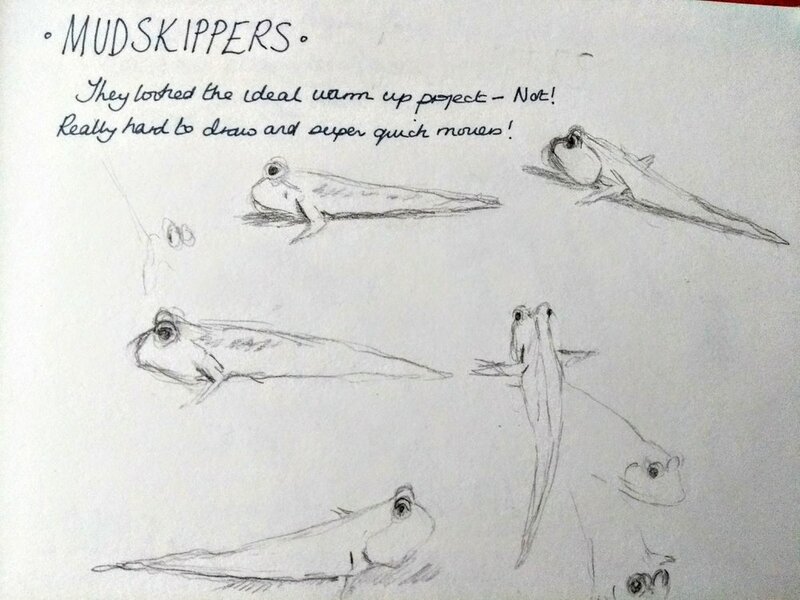 'Let's start in the aquarium and sketch the mudskippers' Liane suggested, 'they'll be a great warm up'! What could be easier? These simply shaped little fish, sitting around in their tank looked ideal models. Except, as we quickly learnt, mudskippers use their fins to move around in a series of skips, and they move really fast! That body shape was deceptively tricky, and the almost cartoon like eyes were hard to capture, without them looking something from a Disney animation. It was half term holiday so the aquarium was busy. The hysterical giggling, and exclamations of 'no, don't move, oh no, moved again, I can't do this'! seemed to be as much an attraction for the visiting families as the fascinating little creatures they'd actually come to see! 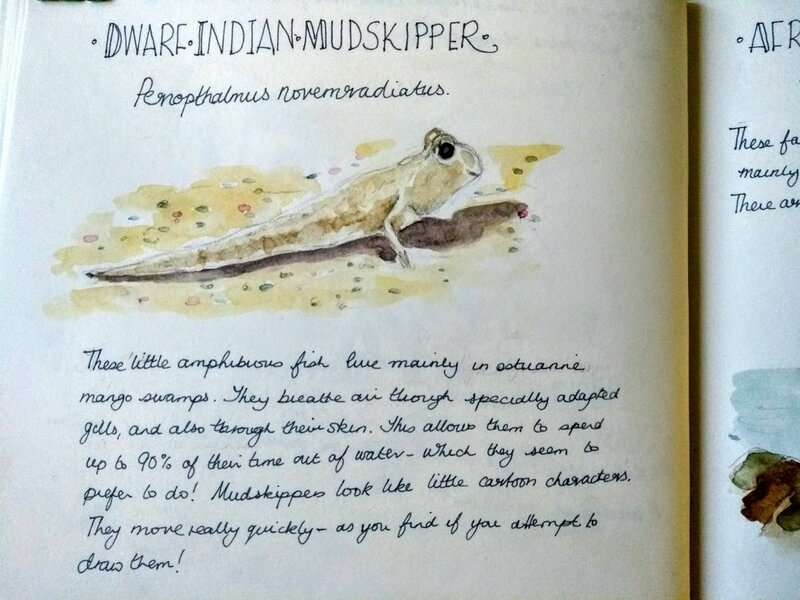 What we found though, was that we knew a lot more about mudskippers after our battle to sketch them. We'd watched their behaviour closely, and read all the information about them, and their habitats. I researched a little more, and worked up a larger sketch from my observations, but I definitely won't be taking these little fish for granted again!